The next piece of the puzzle is falling into place for precious metals. It’s silver. And it’s as bullish as a festival in Pamplona. Previously, I’ve talked about how precious metals miners are moving up while the metals drift sideways. That’s bullish, too. Since the miners are leveraged to the metals, you’d expect the smart money to take positions BEFORE the metals ramp up. Now, there’s a new development. I’m talking about ETFs that hold physical metals. They’re rising, and rising fast. In fact, silver holdings are soaring. Again, that’s what you expect to see in a bull market, because silver is gold on steroids. Whatever gold does — up or down — silver likes to do it even more, in percentage terms. Here’s a chart from Bloomberg on combined holdings in the world’s physical silver ETFs. The most recent action is on the right side. Look at that inflow! 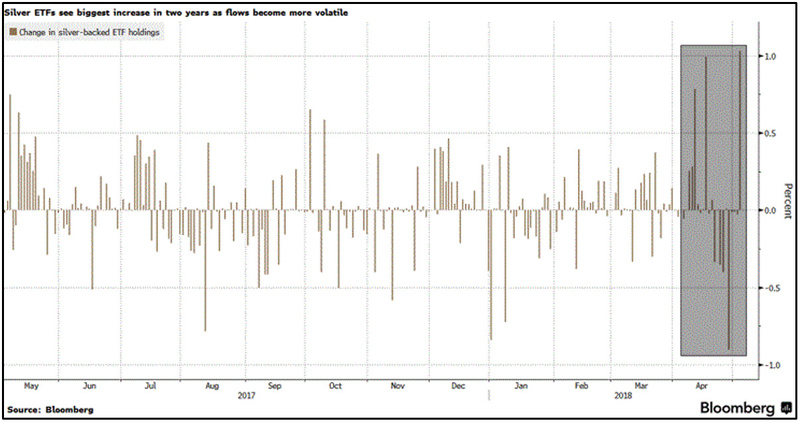 Silver holdings in Exchange-Traded Funds recently jumped by the most in two years. 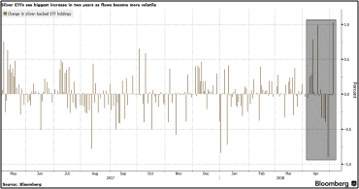 That makes up for recent outflows, and then some. To be sure, flows both in and out have been growing. At the highest level since mid-2013. But this volatility is another sign that something is coming to a boil in the metals markets. 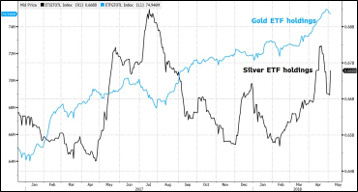 Investors dumped silver ETFs … and then turned around and bought them with both hands. One reason is that silver is cheap compared to gold. It recently took 79.8 ounces of silver to buy one ounce of gold. That kind of peak usually precedes a rally in both metals. And silver rallies more in percentage terms. Heck, silver is such a drama queen, it should have its own Mexican soap opera. • Industrial Applications. Silver is the best electrical and heat conductor of all metals, period. So, it has all types of industrial uses. Silver is also a vital chemical reagent. Industrial demand for silver — which has industrial, as well as a precious metal, characteristics — grew by 4% to 599 million ounces in 2017. • Silverware and Silver Jewelry. Demand for these items rose 12% and 2% last year. This continues to look bullish. • China’s Solar Boom. China installed a total of 9.65 GW of solar power capacity in the first quarter of this year. That’s up 22% over a year earlier. And each solar panel uses a little silver for its electrical connections. Last year, the solar industry gobbled up 94.1 million ounces of silver, according to the Silver Institute. Sure, solar panel designs are becoming more efficient and using less silver per panel. But at the same time, the total number of panels produced is exploding. According to Platts, solar panel silver demand was recently expected to be at about 107 million ounces this year. If solar installations keep outpacing even the most optimistic predictions, that demand will go higher. Global solar PV (photovoltaic) installations hit 100 gigawatts last year, way ahead of estimates early in the year. In 2018, global installations are expected to pass 107 GW. That’s according to GTM Research. The final number could be higher. One part of silver demand is lagging: demand for silver coins and bars. That fell 27% last year. And it hasn’t picked up so far this year … yet. This, I believe, is one of the primary forces weighing on silver prices. But this may just be people turning bearish at exactly the wrong time. The smart money — those buying ETFs and silver miner stocks — are already getting busy. Permalink: http://schrts.co/x7riSH Click image for a larger view. Let me show you what I mean. 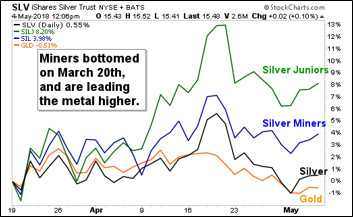 Precious metal mining stocks recently put in a bottom, on March 20. Let’s take a look at how silver miners and junior miners have done since then. You can see the metals haven’t moved much since that bottom. In fact, gold is down just a bit. 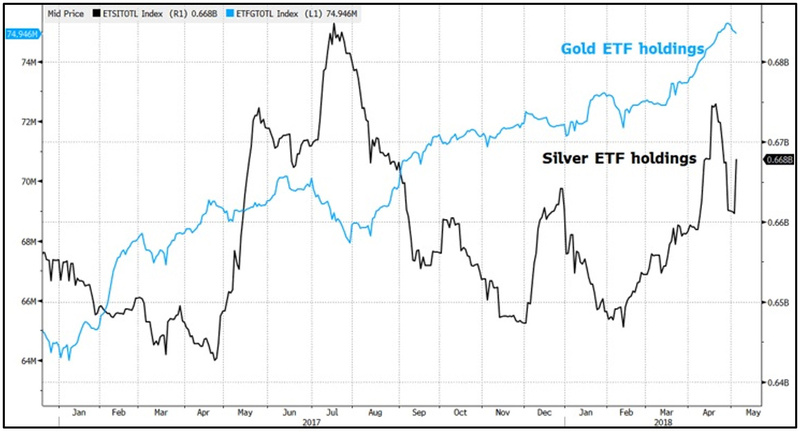 But silver miners, as tracked by the Global X Silver Miners ETF (NYSE: SIL) are ramping up. 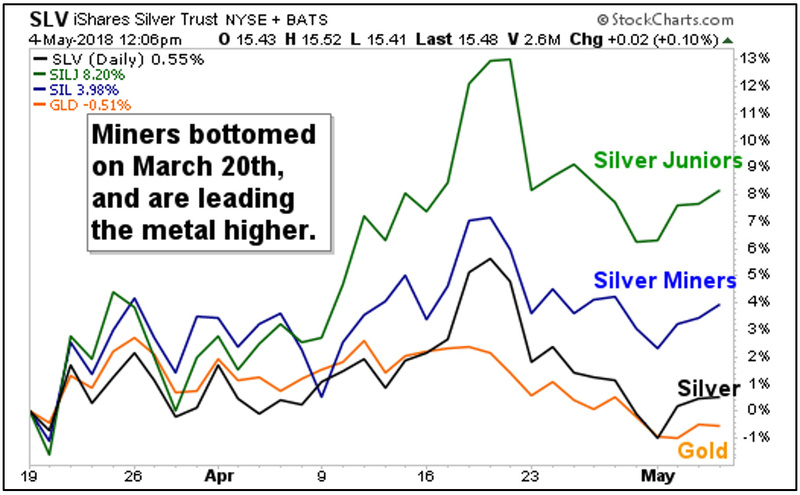 And junior silver miners, as tracked by the ETFMG Prime Junior Silver ETF (NYSE: SILJ) are leading the way. But what about all the other things that can affect the market? Supply is important, but it’s pretty flat. And then there’s the Fed. The market seems to hang on the Fed’s every word about interest rates like the FOMC is tossing around a live hand grenade. Don’t worry about it. We know we’re getting three more rate hikes this year. The next one will probably be in June. That, and other rate hikes, are already priced in. The chances of the Fed hiking faster are slim. The chances of something going wrong, economically or geopolitically, are at least 50/50. And if that happens, the Fed might hike LESS. So, know this silver bull for what it is. It’s moving slowly now. Giving you a chance to jump on. My subscribers are riding this silver bull with select miners leveraged to the metal. You should consider donning your spurs and chaps. And get ready for a wild ride.